Bosnian Serbs have voted overwhelmingly to keep 9 January as a national holiday in defiance of Bosnia's highest court. With more than 70% of votes counted in Sunday's referendum, 99.8% supported the holiday, authorities said. The court ruled the date discriminated against Muslim Bosniaks and Catholic Croats and should be changed. Serbs declared the creation of their own state within Bosnia on 9 January 1992, fuelling an ethnic conflict in which about 100,000 people died. Bosnia is still split along ethnic lines between the mainly-Serb entity and a Muslim-Croat federation. The Constitutional Court, based in the Bosnian capital Sarajevo, banned the referendum. About 1.2 million people were eligible to vote and authorities said turnout was more than 56%. 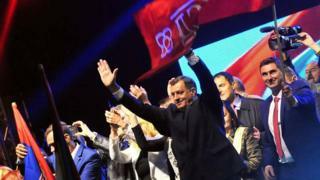 Bosnian Serb President Milorad Dodik said the referendum would go down in history as the "day of Serb determination". "I am proud of the people of Republika Srpska, of all those who came out and voted," he said in the town of Pale. Regardless of the result, the referendum has already damaged ethnic relations in Bosnia and, arguably, the credibility of the international officials who still oversee the country. Bosnian Serb President Milorad Dodik has challenged the authority of the national court, which ruled the 9 January holiday unconstitutional and banned the referendum. He also ignored pressure from the European Union, the international high representative and Serbia. This defiance has increased fears that Mr Dodik might follow through with his threat to hold a secession referendum. The high representative has the ability to remove politicians from office if they threaten the terms of the Dayton Peace Agreement. But in recent years those powers have been used only rarely. As well as being the anniversary of the declaration of a Bosnian Serb state, 9 January is an Orthodox Christian holiday. The International High Representative to Bosnia-Hercegovina, Valentin Inzko, told the BBC that the vote was "illegal and unconstitutional". "No mistake, decisions of the constitutional court are final and binding..., and the constitutional court was very, very explicit..., it suspended this referendum," he said. Bosniak leader Bakir Izetbegovic, meanwhile, has accused Mr Dodik of "playing with fire". The BBC's Guy Delauney in neighbouring Serbia says that the Bosnian Serb leader has been deliberately provocative by insisting on celebrating the national holiday on 9 January. Analysts say by flouting the court, one of the federal institutions set up at the end of the war in 1995, Mr Dodik is threatening the Dayton Peace Agreement, which ended the conflict.